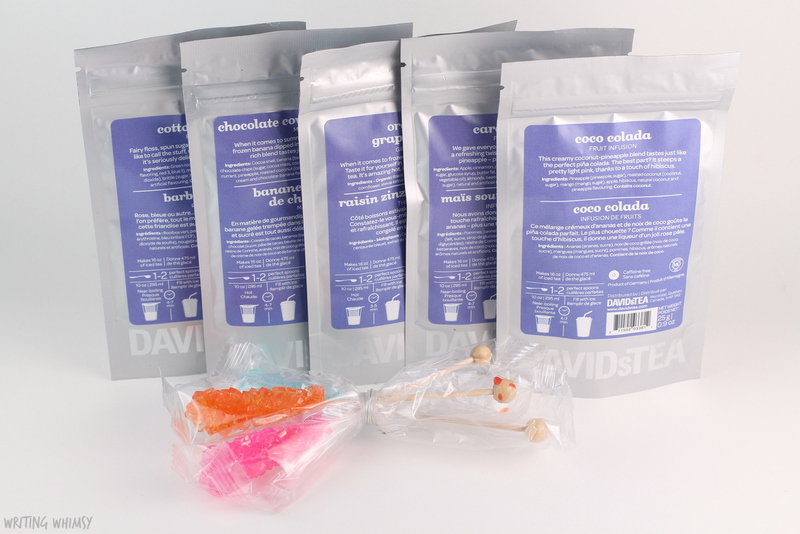 I get really excited about new DAVIDsTEA Collections. I mean, really excited. As soon as I’m near a store I make sure to pick up at least a little bit of all the new teas (usually more than a little) because I just want to try them all out, and usually I end up with a new favourite I have to stock up on before it disappears. 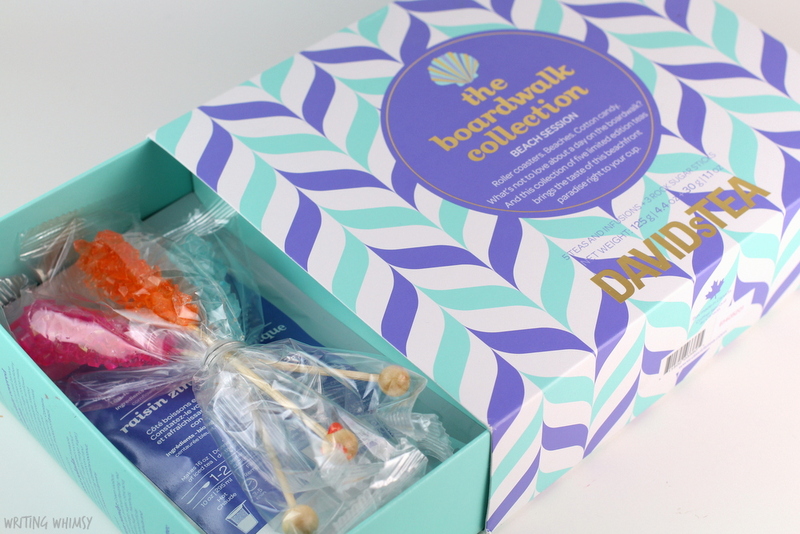 I’ll definitely have to stock up on a few of the teas in the new DAVIDsTEA The Boardwalk Collection! In addition to sell all the teas individually in whatever amount you want, you can pick up the 5 teas–3 new, 2 returning–from the DAVIDsTEA The Boardwalk Collection in one lovely boxed set. It contains 25 grams of each test, perfect for about 5 large cups to test out, as well as three rock sugar sticks you can use to sweeten your tea or just eat on their own if you are a sugar addict like I am. 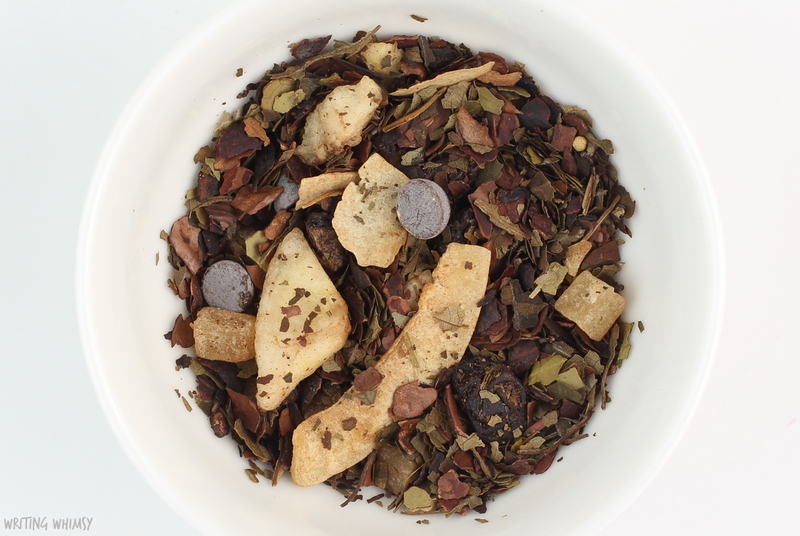 The teas in the collection include Cotton Candy, Coco Colada, Caramel Corn, Grape Freeze, and Chocolate Covered Banana. Yum! 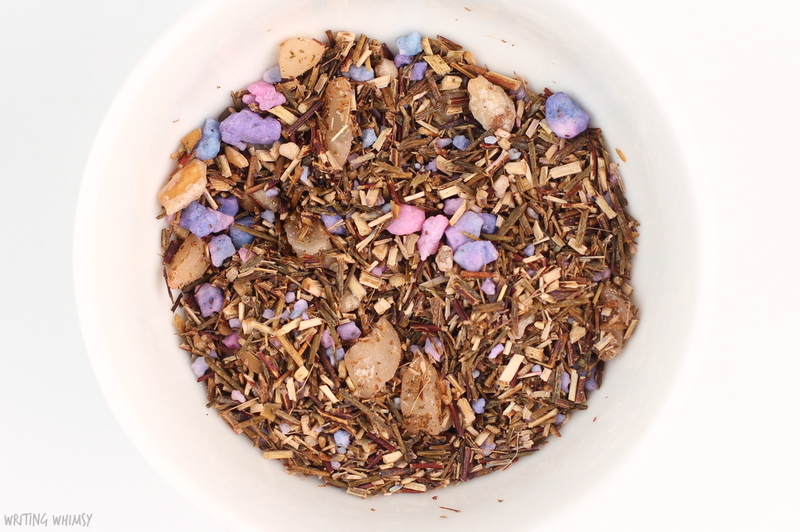 DAVIDsTEA Cotton Candy is a rooibos tea made with green rooibos, sprinkles, mango, brittle and flavourings. I was pretty skeptical of this one when I first tried it in 2014, because of the sugar chunks in it as well as the fact that I don’t drink a lot of rooibos. However, this caffeine-free tea is a lovely sweet rooibos without being overly sugary. I like to drink this tea warm, although it would probably work well iced too. Whatever flavouring DAVIDsTEA adds, this really does have an authentic cotton candy flavour! DAVIDsTEA Coco Colada is a creamy herbal tea made with pineapple, roasted coconut, mango, apple, hibiscus and natural flavourings. I am very skeptical of coconut in my tea, but this mixes well with the pineapple to result in a pina colada taste. I tried it hot but preferred it iced, where the hibiscus is quite subtle in flavour but gives it a light pink colour. It has a light fruity flavour from the pineapple (especially) and there’s a bit of an almost coconut water taste to it. I won’t consider myself a total coconut tea convert, but I finished my bag of this and I definitely recommend it for hot summer days. 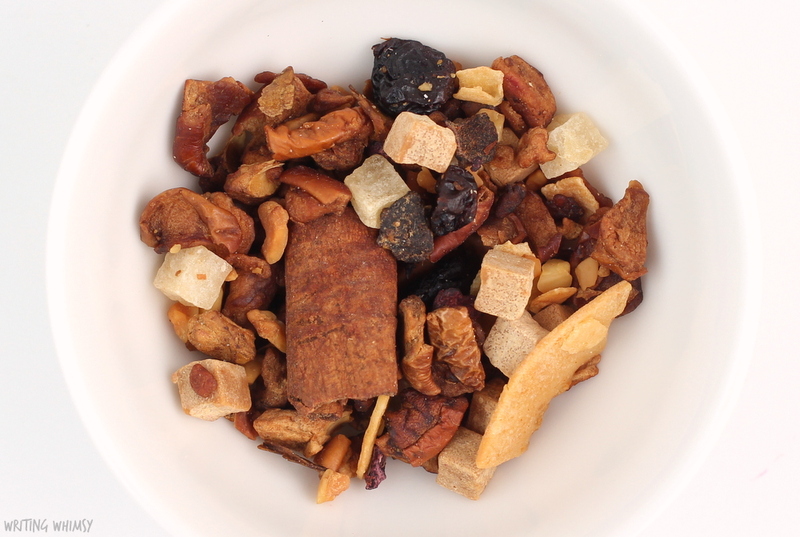 DAVIDsTEA Caramel Corn contains apple, cinnamon, pineapple, caramel, currants, almonds, beetroot, coconut, popcorn and flavourings. This is another returning tea, and having finished up a whole tin of it I’m happy to see it back. 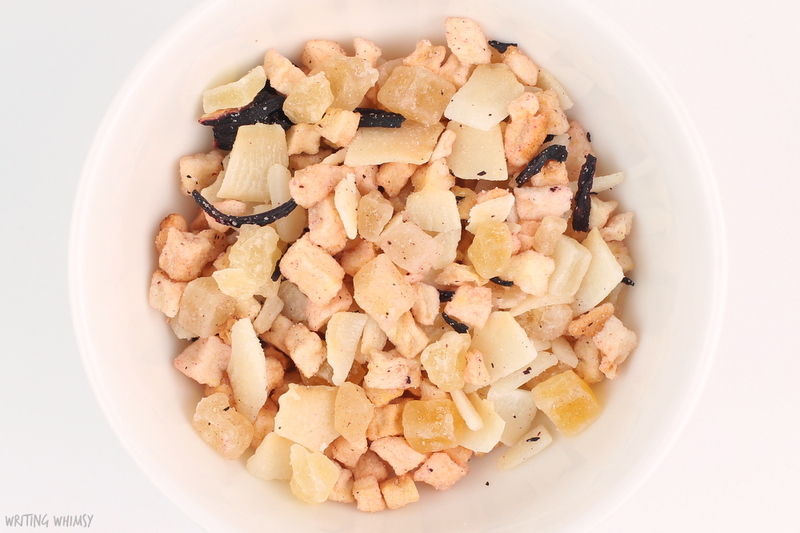 It has a creamy apple taste with warm notes from the spices and some nuttiness as well. Overall, it reminds me quite a bit of DAVIDsTEA Forever Nuts. It also turns a really pretty red from the beetroot, and I love it warm so much I’ve never even tried it iced. 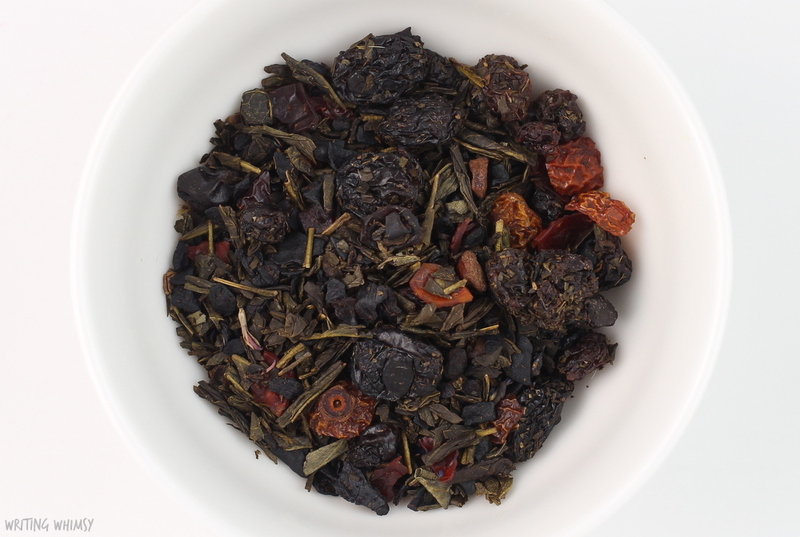 It’s quite a sweet tea and a great herbal pick for “people who think they don’t like tea”. Even if you do like tea, definitely try this one. DAVIDsTEA Chocolate Covered Banana is a maté tea made with cocoa shell, banana, sweet blackberry leaf, chocolate chips, currants, pineapple, roasted coconut, green maté, and natural flavourings. I honestly expect to find this disgusting from both the ingredient list and the description, but it’s actually a delicious, chocolately, creamy, tea that is not overwhelming in the sweetness or the banana flavour. This is a good maté for people who tend to shy away from maté, since the other flavours dominate, but you still get a nice caffeine boost. I really love that there are cocao shells instead of just chocolate chips in this tea because it really gives it a delicious flavour. I bet this would make a delicious latté but I finished my bag too quickly to test it out–I will definitely be picking up more! 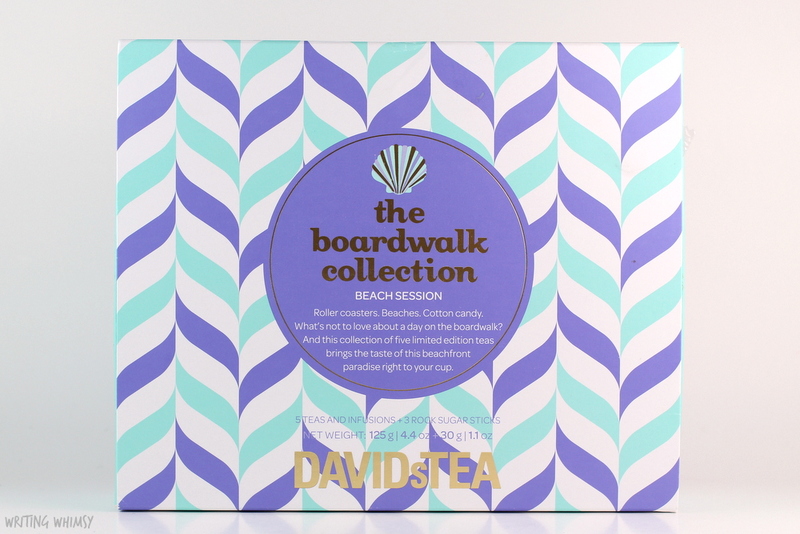 As I said, I am always really excited for new DAVIDsTEA collections, but the DAVIDsTEA The Boardwalk Collection is the first one in awhile where I’ve really loved every single tea. Whether you’re looking to make a latté, an iced tea, a popsicle, or just enjoy a regular hot cup of tea, there’s something you’ll love in this collection. Or maybe, like me, you’ll love all 5! Have you tried out any of the Boardwalk Collection? Let me know if you have a favourite so far!